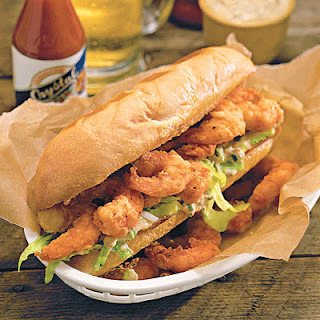 If you've never heard of a Po'Boy, you've missed half your life. There are many different variations, my favorite being the shrimp po'boy. Heaping amounts of shrimp is piled into warm toasted french bread and dressed with lettuce tomatoes. I don't like pickles so I always skip that. The sandwich is finished with a remoulade sauce which adds even more levels of flavor. If ever you take a trip to New Orleans, be sure to tantalize your palette with a Po'Boy. One of my favorite spots is Dress It restaurant on the corner of Camp and Gravier street. Drop by and tell them Val sent you! Thanks for the shout out Val!! I heard that Dress It place is amazing. ;) We all miss u.
I enjoyed the show plus you made me hungry. Great Job!!! When are coming back to the New Orleans area in order to prepare a meal or two for us.